One of my goals is to learn how to do bead embroidery. I just love it! There just seems to be so many different things that you can do with it such as the photo on the left. I have purchased several books by the masters on how to do it and I have bought several tutorials online as well as taking an e-course from Marcie Abney on it. But for some reason it still eludes me. Don't you just love this! It just screams spring to me! I would just totally love to create something this stunning! 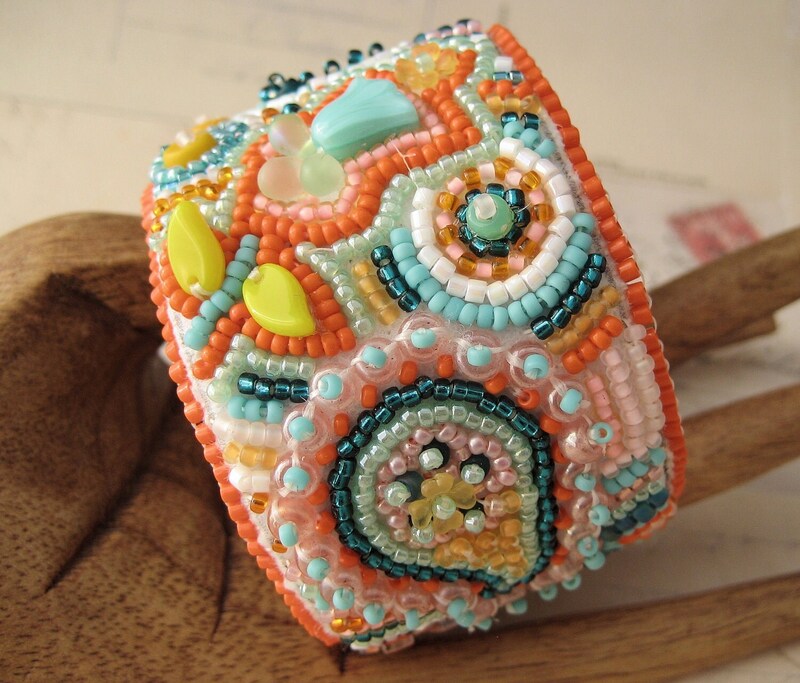 I have tried to make a beaded cuff a couple of times and I will sew the focal piece on and for whatever reason I just cannot seem to get past that step. Either I sew the focal on crooked or I just get totally stumped on what beads I want to use so it always ends up being a UFO. (My UFO pile is getting rather large) Perhaps one day I will be lucky enough to create a piece like this that I can be proud of. Perhaps I am being to ambitious as I am still pretty new to beading. Who knows!? One thing that I have recently discovered is CRAW! CRAW is Cubic Right Angle Weave. I really love it and it works up really fast for such a great result. I stumbled across this video on youtube from one of the former Bead Mavens Ms Heather Collins. Heather makes learning this stitch a breeze and to be honest I really wish that she would do one on St. Petersburg stitch as that is the next one that I want to learn. I have created a piece using CRAW that I will show you on the 25th for the 7000 bracelets for hope project. Speaking of that I really need to go get that piece mailed. I hope everyone is doing well. 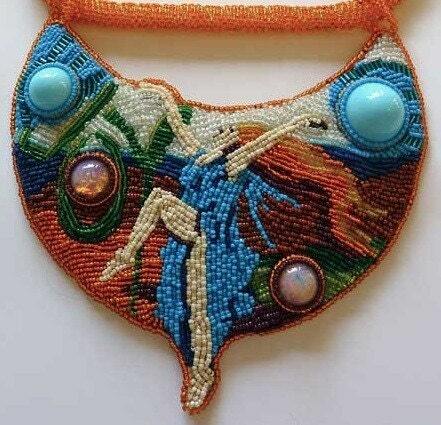 I know just how you feel about bead embroidery I would love to be able to do something even a fraction as beautiful as some of the bead embroiderers that I follow. Thank you for sharing the CRAW video it was very helpful I'm going to try it. I have to get my bracelet mailed also. I am glad that you found the video helpful. I love CRAW it really adds so much more texture to a piece and it really is a simple stitch. The hardest part of it to me is starting it. I hope you are doing well Therese! Wow, that necklace is amazing! I have recently started bead embroidery too and love it. At first I felt like I would never get it, but finally it clicked and I just made my first cuff, it's not perfect, but I love it anyway! I hope it 'clicks' for you too. Thanks Sarah I hope that it clicks for me soon :) I love love love your Winter Light piece. It is beautiful! WOW! Blown away. And the colors are amazing -- you have a great eye for design! Hey Don't give up on the embroidery!! You can make it your own!! you don't have to start with a focal. Just start with beads that you love !! You can have several small focal's or beads of relative interest- they don't have to be dead center!! and it does not have to be all matchy matchy either. Think of it as a bead collage. I have started teaching my beaded collage cuffs and I tell my students to jut let the colors flow- use what you love and make it a collage of color- you can stay to one colorway or use multiple colors but all the same finish. there are so many ways to go about it. If You would like, feel free to contact me and we can talk about it further!!! I would be most happy to help you get your bead embroidery groove on! !